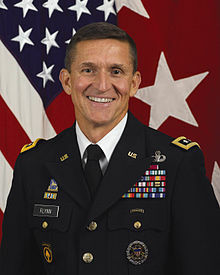 Michael Thomas "Mike" Flynn (born December 1958) is a retired United States Army lieutenant general. On January 20, 2017, Flynn became the 25th United States National Security Advisor. He resigned on February 13, 2017. He last served as the 18th Director of the Defense Intelligence Agency, from July 22, 2012 to August 7, 2014. On November 18, 2016, Flynn accepted president-elect Donald Trump's offer of the position of National Security Advisor. The Wall Street Journal reported on January 22, 2017, that Flynn was under investigation by U.S. counterintelligence agents for his communications with Russian officials. On February 13, 2017, Flynn resigned the position of National Security Advisor. On December 1, 2017, it was reported that Flynn had accepted a deal with Special Counsel Robert Mueller to plead guilty to a single count, that of "willfully and knowingly" making "false, fictitious and fraudulent statements" to the FBI, a felony. ↑ Khan, Mariam (2016-11-18). "Trump's National Security Adviser Has Called Islam 'a Cancer'". ABC News. Retrieved 2016-11-18. ↑ "National Security Adviser Michael Flynn resigns". The Hill. February 13, 2017. Retrieved February 13, 2017. ↑ Herb, Jeremy (December 1, 2017). "Flynn charged with one count of making false statement". CNN. This page was last changed on 27 March 2018, at 22:40.